When I first glanced at the headline, “GPD tracks percent of cars yielding to pedestrians,” I thought, in my jet-lagged haze, wow, here’s a study comparing GDP rates to pedestrian yielding, and I wondered, what’s the correlation — higher GDP means more driving, more exuberant driving, less yielding to pedestrians? A new kind of Smeed curve? 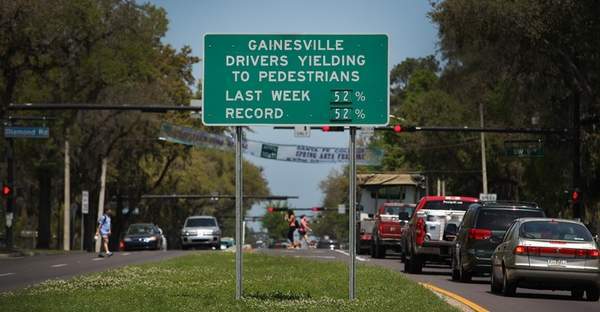 But it’s actually the Gainesville Police Department that’s been trying to make things better for those on foot — and, say it again, everyone’s a pedestrian, even if just leaving one’s car — and I was particularly intrigued by the updated feedback signs (pictured above). Needless to say, 52% is pretty pathetic. This entry was posted on Thursday, May 6th, 2010 at 8:10 am	and is filed under Pedestrians, Uncategorized. You can follow any responses to this entry through the RSS 2.0 feed. Both comments and pings are currently closed.